The introduction to this new book immediately got our attention: "We asked a selection of contemporary Londonists — the term is coming once more into fashion but is originally Marcus Fall's from 1880...". Well, blimey. The 26 contemporary 'Londonists' — and most do have strong London connections — were each asked to critique a London-based novel. Their choices certainly intrigue. Dickens is missed entirely, and the list also steers clear of "that quartet of modern sages and visionaries of the city, J.G. Ballard, Michael Moorcock, Peter Ackroyd and Iain Sinclair". Also absent are Conrad, Amis, Carter, Gaiman and Self. As the Afterword says, the editors make no claims to comprehensiveness, instead relying on the individual enthusiasms of the contributors. The resulting list, then, is far more interesting than another slog through the usual suspects. A few old favourites do reel us in (Conan Doyle, Virginia Woolf, Patrick Hamilton), but then we're drawn to a dozen less-familiar authors such as Pamela Hansford Johnson and Thomas Burke. We begin with George Gissing's The Nether World and end with what seems to be its abbreviation, NW by Zadie Smith. The contributors are also well chosen. Sarah Wise tackles A Child of the Jago, Rachel Lichtenstein analyses Simon Blumenfeld's Jew Boy, Cathi Unsworth takes on The L-Shaped Room... Some writers really tubthump their choice, others are more critical. Andrew Lane's appraisal of The Sign of Four, for example, imagines Conan Doyle piecing the action together from a London gazetteer, rather than drawing on any first-hand knowledge of the capital's streets. All in all, this is a surprising and approachable collection, which can be enjoyed by a general audience as well as literary types. The mix of familiar and not-so-familiar sets it apart from the numerous other London anthologies from recent years. Our reading list just got several novels longer, and the application of the word 'Londonist' just got broader. 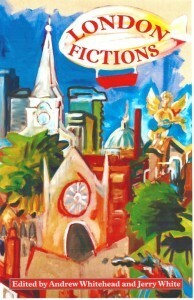 London Fictions, edited by Andrew Whitehead and Jerry White, is out now from Five Leaves Publications, as a book or ebook. You can also peruse more examples on the wonderful London Fictions website, and follow on Twitter (@LondonFictions) or Facebook. Read more London book reviews.